A popular time to capture photos of the new addition to the family and all his relatives is at the christening, or naming ceremony. Like a wedding most people take the opportunity to gather and celebrate for a christening so why not book a photographer ? It’s too busy and important a day to leave to Uncle Bob – and anyway he wants a chance to catch up to gossip and have a drink with Aunty Sue!! When you book Symply to cover your christening you will typically get coverage at the church or wherever the ceremony is being held, and about an hours coverage at the reception. Photos at the reception can be informal – as things happen – or we can set up a mini studio and you can have more formal family photos taken with the baby. The cost for approx two hours coverage, and all the photos taken is just £250. Photos will be put onto a USB for you to keep. Baby portrait albums, framed prints, canvases can all be purchased once you have had the chance to go through all your photos and picked your favourites. All the images will also go onto your own password controlled website so family members who have travelled , or not been able to attend can also get the opportunity to view and purchase prints. 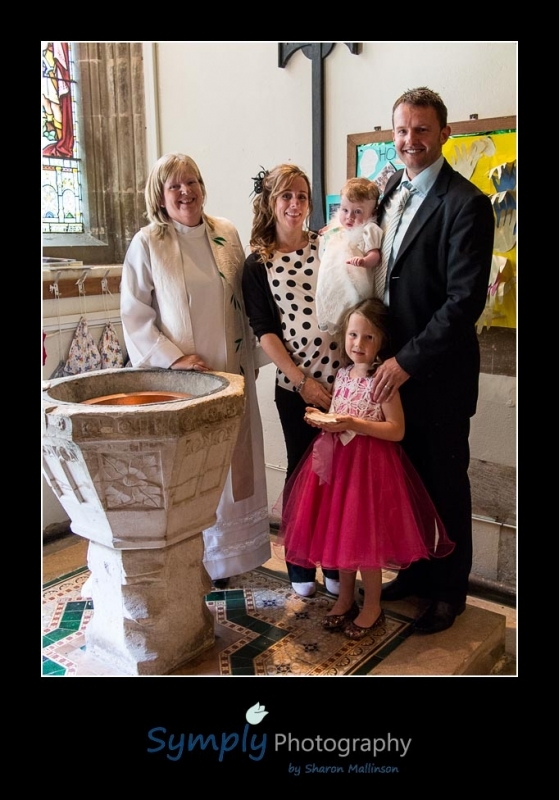 Should you wish to book us for your Christening Photography please phone 01529 241633 to check your date is free. A £50 non returnable booking fee (subject to T&C’s) will secure your date and the balance of £200 will be due on the day of the christening.